You are currently browsing the daily archive for December 15, 2006. Here’s another light tug steaming southward in front of Weehawken. The dark red superstructure and large white “M” make this unmistakeably a Moran tug. Moran began in the port of New York, and 150 years later is still a major presence. The tug above is said to be towing “on the hip.” The hip here might be the widest or beamiest part of the tug. 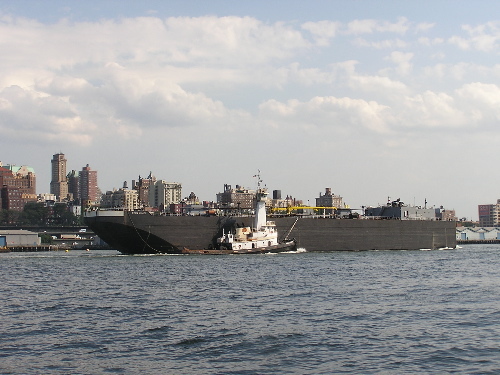 A barge towed on the hip can be moved with far greater control than one towed on the hawser. Notice on the tug above the raised pilothouse that allows the helmsman to see over the barge. 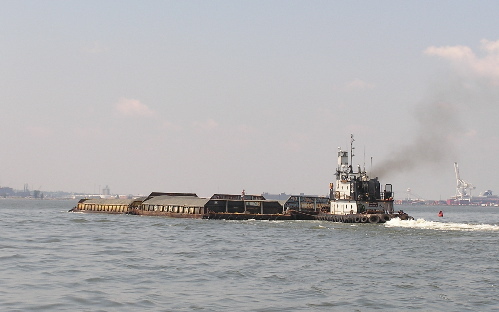 Moving a barge–or multiple barges–on the nose is probably the most in the harbor. Looking for giftbook suggestions? 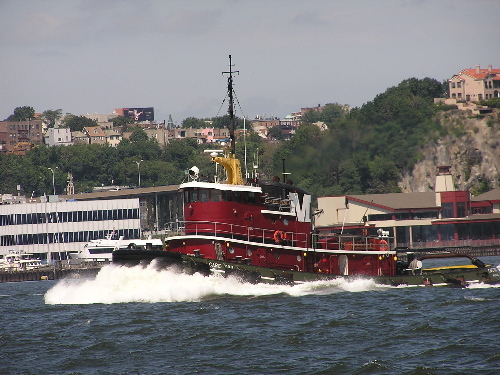 Check out Geo Matteson’s Tugboats of New York written by a former tug owner.